Mr and Mrs D. in Maidstone wanted a contemporary natural oak study to include bookcases, desk pedestals, filing cabinet and cupboard. 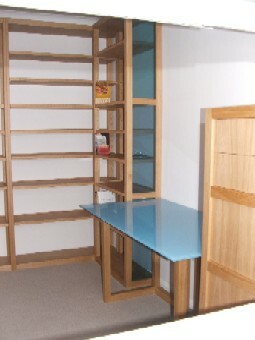 The design incorporated the use of blue glass featuring on the bookcase ends and desk top. The filing cabinet includes lockable drawers and stop allowing only one drawer open at a time. The top two drawers are set on quadro runners with push open catches. The fronts are all matched and set at the same overall heights. Natural oak study featuring blue glass. 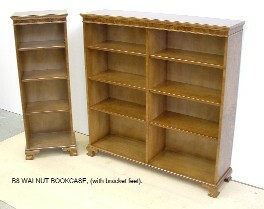 For a free quotation and advise phone the Sussex Bookcase Company on 01580 830667 now. 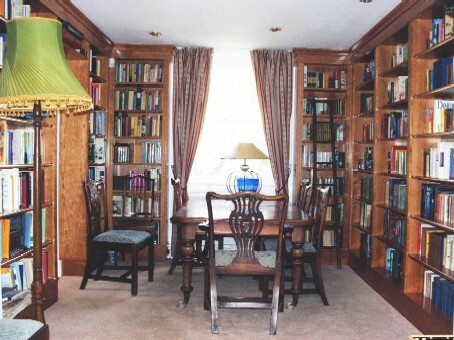 Clients wanted to fill two rooms with book shelves creating a beautiful reading area with the antique dining table nestling in between. The bookcases were constructed from a combination of solid cherry and cherry veneered board and polished without any stain prior to installation. Visiting the library after completion, the rooms were so quiet, it just goes to show how good books are as sound insulation. Whether its a single free standing bookcase or several fully fitted bookcases, we can make the most of the available space. This piece was created to house a hifi system and books amongst other things. The carcase was constructed from ash veneered board,drawer linings from tulipwood with dovetail joints, doors and drawer fronts from ash. This 2.6metre high piece was comissioned by Mr and Mrs M. in Hawkhurst for maximum dust free storage. The unit was constructed in ash and ash veneered board and spray painted to the colour of their choice. 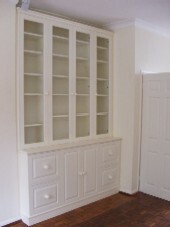 The wood grain shows through the paint work.The fully adjustable book shelves are set behind glazed doors. Four filing drawers are set to foolscap spacing with fielded panel drawer and door fronts. For more ideas continue browsing our site. 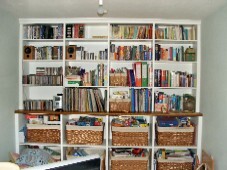 Mr and Mrs G. from Goudhurst wanted to use baskets for their storage solution, so we designed the shelves accordingly. The central fixed shelf was oak with a bull nose front moulding and finished in medium oak. The fully adjustable book shelves replicate this moulding too. 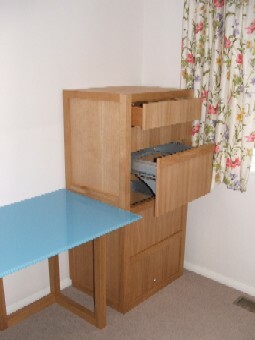 The unit was neatly fitted at one end of the room thereby keeping all the items in daily use together. For more ideas on storage solutions continue browsing our site. The variation bookcases are available in 90 + sizes in mahogany, yew, oak and cherry coloured finishes. Natural polished finishes are available in oak, white beech, maple and ash.